The shell was sitting in a memorial display at American Legion Post 76, where two volunteers recently decided that the device should probably be affixed to the floor. They took off the shell head and were shocked to discover a trove of documents, magazines, a menu from a local hotel, and a trench lighter from World War I. But this wasn’t the first time the shell’s time capsule had been opened. It’s unclear exactly how many times it has been accessed in the past, but we know that it’s been unsealed at least once since 1934: Not only was there a note inside about some missing brandy, some of the newspaper clippings and magazines were sealed in zip-loc bags, which of course didn’t exist in 1934. But according to the Arlington Times, it doesn’t appear that anyone has added anything else to the capsule in its 81-year existence. 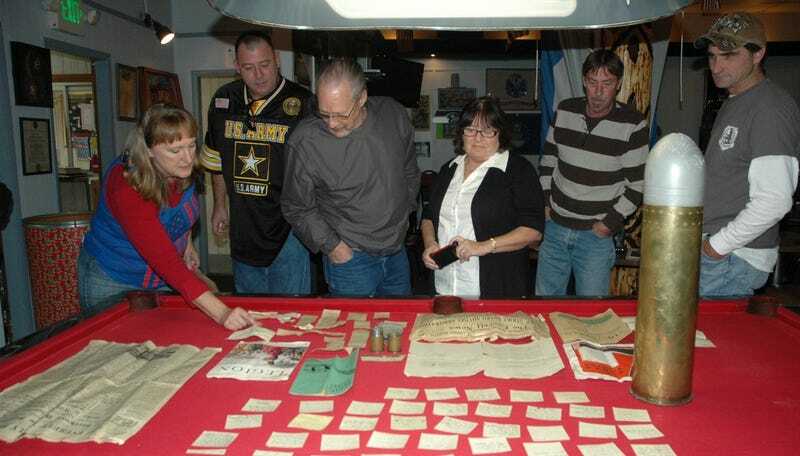 The folks at American Legion Post 76 are now considering whether to add something from their own time to the existing contents–creating something I’ve come to call a “leapfrog” time capsule. But if they ultimately choose to add something, they know they’ll be confronted with one of the hardest questions posed to time capsule makers of the 21st century: What medium will be future-proof? It’s a tough question. I have hard drives merely a decade old (with firewire ports) that I have no way of accessing with my current computers. Humbly, I’d suggest that they use as many deadtree materials as possible. And if they’re going to include digital materials, use the most common drives and most common ports (I’d vote USB in this case) and the most common file types (jpegs, mp3s and Word docs?). Frankly, I don’t know for certain what will last into the future. Even deadtree materials degrade over time. In retrospect, it’s probably good that whoever snagged that brandy did so before it could have potentially leaked all over the paper items in the time capsule. Whatever the people at American Legion Post 76 decide to do, I wouldn’t suggest adding any more brandy. If the thieves don’t get at it first, it’ll become a potential danger to any paper and electronics they include inside this 1930s treasure. Time capsule creators should always save the brandy for themselves. It’s generally much more useful inside your belly.